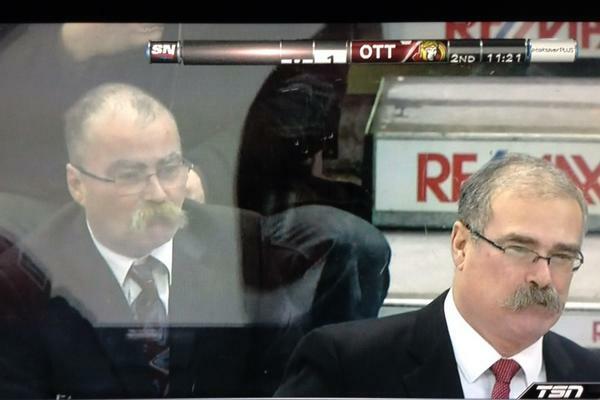 Considering how dark of a week it has in the hockey world, it was fitting that a hilarious man with the most awesome mustache had to be fired in Paul MacLean. Yes, it was called months in advance, but it’s not like Ottawa was going to make a playoff push anytime soon in a deep Atlantic division. Also this week, one of the best hockey players in his generation in Jean Beliveau passed away. A plane crash occurred in a neighborhood not to far away from my apartment complex and Jen Lute Costella is no longer writing for Puck Daddy. Most importantly, two prominent members in hockey media circles, Steve Lepore and Adrian Dater, were fired for their subpar (and really, that’s the understatement to end all understatements) behavior towards female followers on social media. Here are the two articles that explain them in absolute detail. If you include Harrison Mooney of Puck Daddy, that is three members in the male-majority hockey media that have been let go for the exact same circumstances within a four month span. You would think that with hockey being so popular amongst women and that Women’s hockey has been an Olympic sport since 1998, that the game would be significantly more welcoming towards that demographic. That definitely doesn’t look like the case now, especially if there was preconceived pessimism about this topic beforehand. So what did commissioner Gary Bettman had to say about the latest incidents regarding Lepore, Dater and Mooney? “I don’t know what you’re talking about”. It’s times like these that make you disgusted to be a hockey writer and a hockey fan. If only every commissioner can have the same awareness and take the same action like Adam Silver had with Donald Sterling back in April. With that, I leave you, with a horrible taste in my mouth, the latest version of the nerdy 30. Please do better, hockey! It has been dark times for the Avalanche. Up to ten players are on the injured list right now, the puck possession is predictably down and Nick Holden is being told to play forward for them. Last time I checked, Holden is not Brent Burns or Dustin Byfuglien. Sadly, this was expected from Colorado who benefited immensely from a huge season by Semyon Varlamov in goal and worsened, no matter what, for the losses of Paul Stastny and PA Parenteau. Plain and simple, Danny Briere has not had a good season in three years and though Jarome Iginla has played really well, considering where he is in his career, him and Briere are not balancing the rest of the lineups and the bottom six of the forward lines have suffered immensely. Even before he picked up a leg injury, John Mitchell has not been as good as he was last season and the same can be applied Jamie McGinn. On the backend, Erik Johnson has actually had a good season and Tyson Barrie continues to develop into one of the best young defenseman in the NHL. However, everyone else along the blue line are either journeyman that have no business playing in the NHL again (Zach Redmond, Brad Stuart), are simply not getting the job done playing secondary roles on the team (Holden, Nate Guenin) or always find a way to miss close to all season due to injury (Ryan Wilson). The Holden situation is even more insulting considering that he signed a three-year extension last summer. Prospects like Chris Bigras, Duncan Siemens and Stefan Elliott have to be chomping at the bit and hoping they can make a major impact for the Avalanche within the next couple of months. The Washington Post’s Neil Greenberg put up a very insightful post regarding the reasons behind firing of MacLean and almost every point is a very good one. That being said, Yahoo Sports’ Puck Daddy also made good points in blaming ownership for all the struggles. I personally agree with both sides, but I also feel like MacLean’s firing had more to do with why Bruce Boudreau got fired. Simply put, the pressure weighed too much on a coach that had all the luck run out on his side and was given a roster that worse every year at a time when the expecations were to win now. That being said, time and again, MacLean thought giving playing time to overrated bruisers like Chris Neill, Chris Phillips and Zach Smith would make this team good instead of giving as much playing time as possible for skilled forwards like Bobby Ryan, Kyle Turris and Mike Zibanejad. Oh, and David Legwand hasn’t been playing like an NHL player for 13 months and counting. The next head coach has to make this team fun to watch again and rid this team of any of the old beligerant ways Ontario teams think of how to win (with grit and heart and all the other words you would see in a sports movie that is produced by Disney) when really it is simply being more skilled than the other team, and that is assuming their owner ever cares about making Ottawa a consistent championship contender in his lifetime. So you may be asking yourself how the best team in the Western Conference, standings points-wise, is sitting in 11th place on the Nerdy 30. For one, this team is nothing more than mid-table at goal differential (only a +6 versus Chicago’s +32) and at score-adjusted puck possession (50.5%). The other is the fact that injuries are really beginning to pile up for the Ducks. Again, it has been a concern from day one as to whether head coach Bruce Boudreau can find someone that can play left wing for Ryan Getzlaf and Corey Perry and make sure they can balance a good top six forward group. Now, Perry is out with a sprained knee and the recently acquired Rene Bourque is playing on the top line, along with Devante Smith-Pelly. The fact that Bourque is getting any top six minutes in the NHL is a major issue. Personally, I would switch Bourque with Patrick Maroon in a nanosecond. Also, 13 defensemen have already been used in Anaheim. Francois Beauchemin and Ben Lovejoy have been out for the vast majority of the season from their respective broken fingers and even the recently acquired Eric Brewer is now on injured reserve with a broken foot. John Gibson is also hurt with that infamous tweaked groin that always finds a way to kill a goalie’s season. This is still a balanced roster and a very young team to watch out for in the long term, but the Ducks need to find a way to kill off teams without the roster being in full strength. Even if the Minnesota Wild have fallen apart since November 4th (3-7-1 during that stretch), they are still leading the league in all the categories that are needed to win Stanley Cups. They are the best shot generation and shot suppression team and only Chicago is better than them in unblocked shot attempt percentage (both at even strength and at score-adjusted). However, their goaltending is just sending them to pits of despair that they better fix, fast. Evaluation on Darcy Kuempfer has to be looked as carefully as possible, considering that he is still 24-years old and goalies usually peak another 4-5 years later. Thanks to hockey-reference’s recent installation of Rob Vollman’s Quality Start Percentage (or QS%), we can break down, game-by-game, whether a goaltender is just genuinely bad or has bad games from time to time. For a player like Kuempfer, even if he is the worst among all NHL starting goalies in even strength save percentage, his Quality Start percentage is hovering just below the league average at 53%. Is that a sign of encouragement? Heck no!!! In fact, since Kuempfer’s first NHL season, he sits 32nd out of 42 goaltenders with at least 50 games played in this new fangled metric. We haven’t hit the level of where we see data collected as to when an individual’s QS% can regress to some level of sustainability, but we do know that it take’s more than Kuember’s 1272 shots to do so. On that note, guess who sits second worst in that same list of 42 goalies that have played 50 games or more in QS%? That would be Kuempfer’s backup, Nicklas Backstrom. You would think that with the rumors swirling over Martin Brodeur and Ilya Bryzgalov, Minnesota would be in the hunt to sign any one of them, especially since they have one of the biggest cap spaces in the league and their best two goaltending prospects are a fourth round pick from last summer’s draft and a 22-year old that has been a disaster in AHL Iowa.